Authors have described chronic Achilles tendinopathy as the most common overuse injury in sports medicine. 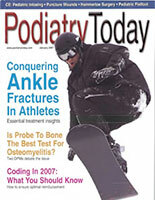 Nagging tendo-Achilles pain presents routinely in our offices as a common foot and ankle disorder. Its estimated prevalence in adults is 2.35 per 1,000 and the condition affects both athletic and sedentary population groups with notorious difficulty in the treatment of chronic cases. Accordingly, let us take a closer look at some of the newer minimally invasive treatment modalities as well as some sound surgical fundamentals in addressing more severe, recalcitrant cases. Understanding the differences between acute tendinitis/bursitis symptoms and more chronic tendinosis is critical for a correct diagnosis. Consider tendinopathy in cases of more chronic tendon pain with scar formation and a more dysvascular status of the region of tendon damage. Baseline imaging should begin with the X-ray but ultrasound and magnetic resonance imaging (MRI) will be most valuable in assessing the disease progression and severity when tendinosis is the primary concern. Tendinosis occurs most commonly in the midportion of the tendon but can also occur at the bone–tendon junction. Overuse may induce the condition but there has been a lack of scientific clarification on the etiology and pathogenesis of Achilles tendinopathy. A study on chronic Achilles tendinopathy (342 tendons) showed that physical activity did not correlate with the extent of histopathology, suggesting that physical activity could be more important in provoking the symptoms in comparison to causing the pathology. Initial conservative measures include custom orthotics, immobilization, icing, anti-inflammatory therapy and physical therapy. Physical therapy may include an effective evidence-based aggressive and properly managed eccentric calf muscle strengthening regimen, which Alfredson and colleagues originally described in their 1998 study. Current literature continues to support the efficacy of eccentric exercises in the treatment of pain associated with chronic tendinopathy. Researchers propose that the greater frequency of the tendon stretch shortening cycle exposures is likely to influence the tendon’s rate of wear and ultimately its ability to repair itself. Of the potential mechanisms of repair with stretching, changes in neuromuscular output appear to be the most promising but are currently not well understood. However, when conservative measures fail, there are a host of alternate minimally invasive options that research has shown to be quite effective prior to open surgical management. How Effective Is PRP In The Achilles? With the progression of orthobiologics and their ease of administration, it is necessary to continue to examine these advancements for the benefit of our patients. One 2015 molecular biologic study involving the popular platelet-rich plasma (PRP) injection suggests that a single injection of PRP in tendinosis using a controlled concentration of platelets and leukocytes does not increase biological markers such as growth factors in rats in midterm and long-term follow-up. This study endorsed the need for specific biological studies that prospectively compare PRP to placebo control groups. As methods of preparing PRP vary and lack standardization and quantification of patient application, a 2014 Cochrane Database study provides value in analyzing pooled data from multiple studies for primary outcome comparison (function, pain, adverse events). Researchers judged the evidence for all primary outcomes as being of very low quality with no significant statistical data between PRP treated groups and controls in short (three months), medium and long-term (one year) measured outcomes. A retrospective study of 83 tendons with diagnosed tendinosis reflected beneficial effects and a low complication rate following single PRP injections on a large cohort of patients with a 50.1-week average follow-up. In this study, there were no reported cases of Achilles tendon rupture and the authors concluded the use of a single PRP injection can be a safe and attractive alternative for the treatment of non-insertional chronic recalcitrant Achilles tendinopathies. The finding of no ruptures stands in contrast to the majority of the literature, which describes chronic Achilles tendinosis as one of the most common risk factors for rupture. Another retrospective study by Oloff and colleagues involved 26 patients, who received a single PRP injection for chronic Achilles tendinopathy. Half the patients had Achilles tendon surgery in combination with PRP administration and the other half had PRP alone. Pre- and post-treatment MRI evaluation revealed the stand-alone injection group and surgical/injection group had statistically significant degrees of improvement. Another orthobiologic therapy gaining popularity is the use of amniotic/chorionic membrane allograft for chronic musculoskeletal disorders. A level 1 study by Zelen and colleagues examined the injection of micronized dehydrated amniotic/chorionic membrane into the plantar fascia. While there was a small sample size in the study, there were good initial short-term outcomes in multiple treatment groups. Amnion-derived stem cells can differentiate toward all three germ layers and one can use these for allogeneic transplantation and store them via cryopreservation. The use of amnion-derived stem cells for superficial digital flexor tendinopathy has been very effective in animal studies. This is promising as there are similar pathogenesis and histopathology with Achilles tendinopathy in man, providing supportive data to encourage the use of regenerative therapy in humans. An additional 2015 Level 1 pilot study in a small sample size with plantar fasciitis directly compared corticosteroid injections with human amniotic membrane injections and showed no statistically significant difference in outcomes. Clearly, more studies are needed with larger sample sizes and anatomical specificity for understanding these advanced modalities and their role with chronic Achilles tendinopathy. Minimally invasive treatments such as extracorporeal shockwave therapy (ESWT) and ultrasound-guided percutaneous tenotomy/fasciotomy have become more routine methods for non-invasive treatment of Achilles tendinosis. These technologies utilize ultrasonic and radiofrequency wave technology for percutaneous microdebridement suitable for in-office or outpatient treatment. Examples include Tenex TX-1 (Tenex Health), Topaz (ArthroCare Sports Medicine) and ReleF (ReleF Technology). The primary mechanisms of healing response most often cited in the literature are an initial inflammatory response followed by neovascularization. The frequency and therapeutic dose depends on the tissue one is treating, the depth of tissue penetration, clinical judgment, research and manufacturer recommendations. While the number of treatments and interval between treatments have not been standardized, three to five weekly treatments are a common protocol. In comparison with open treatment for insertional Achilles tendinopathy, percutaneous execution of radiofrequency coblation (i.e. Topaz, ReleF) is simple and minimally invasive. Bipolar radiofrequency coblation creates a localized plasma layer that dissolves the molecular bonds of soft tissue without excess heat production and theoretically stimulates angiogenesis and healing within the degenerative tendon. Originally researched and developed for recalcitrant tennis elbow, the Tenex TX1 device showed success in a prospective study by Koh and colleagues on 20 subjects with a one-year follow-up. This therapy delivers focused ultrasonic energy, which microsects only pathological tendon tissues. One would complete the Tenex percutaneous tenotomy or fasciotomy using the TX-1 with ultrasound image guidance focused at the degenerated tissue. After the single outpatient procedure, which one can generally complete with local anesthesia, the patient uses a walking boot for a period of two to three weeks. In a 2015 study using a live rabbit Achilles tendon model, Kamineni and coworkers concluded that ultrasound diagnosed tendinopathy responded favorably to percutaneous ultrasonic debridement (Tenex) based semi-quantitative collagen profile and extensive histopathologic sample analysis. In this study, there were differences among the control, injured and treated groups in regard to vascularity, collagen density and collagen fiber organization. The results of this study are in agreement with previously published studies but this is the first study applying ultrasonic therapy to animal model-based tendinopathic tissues. Surgical treatment for tendons that fail to respond to conservative treatment can involve several procedures, all of which are designed to irritate the tendon and initiate a chemically mediated healing response. These procedures range from more simple procedures such as percutaneous tenotomy to open procedures and removal of tendon pathology. In one study, percutaneous tenotomy resulted in 75 percent of patients reporting good or excellent results after 18 months. Open surgery for Achilles tendinopathy has shown that the outcomes are better for those tendons without a focal lesion in comparison to those with a focal area of tendinopathy. It is critical to identify if the pathology is classic posterior heel pain (insertional Achilles tendinopathy enthesopathy versus Haglund’s deformity versus bursitis) as these can have very different approaches. The surgical management of Haglund’s deformity and retrocalcaneal bursitis generally involve three types of procedures: open resection of the prominent posterior superior aspect of the calcaneus and inflamed bursa, endoscopic calcaneoplasty and calcaneal osteotomy. Rush and coworkers describe a percutaneous approach to Achilles tendinopathy when addressing a retrocalcaneal exostosis. This uses a modification of the Bunnell suture weave technique through six stab incisions and a transverse incision proximally combined with the use of a transverse incision and two stab incisions with two interference screws as anchors distally. The Achilles SutureBridge (Arthrex) has become a favored technique for distal knotless security when detachment is necessary. If strength augmentation is required based on the amount of tissue debrided (more than 40 to 50 percent of tendon), consider harvest of the flexor hallucis longus tendon via traditional techniques through the mid arch. Alternately, Decarbo and Hyer describe a less invasive method via a “short harvest” technique in which they transfer the flexor hallucis longus tendon into the calcaneus to replace or supplement the Achilles tendon, utilizing a single posterior incision and interference screw fixation. They further describe isolating the flexor hallucis longus tendon through the tendon sheath along the medial wall of the calcaneus and recommend placing a retractor deep to the flexor hallucis longus tendon sheath to protect the neurovascular bundle. Follow this by inserting the interference screw superior to inferior into the calcaneus and completing the tenodesis of the remaining portion of the Achilles tendon. Past studies on flexor hallucis longus transfer have proven that morbidity is clinically insignificant. With other less invasive options such as amniotic membrane product injections, consider open debridement of the pathological area in only the most difficult cases. If you do perform open debridement, you can complete augmentation with additional advanced biologic tissue membranes. A key to resolution of the process of tendinopathy of the Achilles ultimately involves addressing the strain from equinus deformity, which one can surgically nullify via open or endoscopic gastrocnemius recession with or without (isolated) adjunctive surgical treatment for desirable outcomes in reducing pain. However, this approach has questionable functional outcomes in isolated cases involving chronic tendinosis. Surgical planning is critical to best address the pathology for your individual patient. Proper preoperative diagnostic imaging such as MRI with availability of intraoperative ultrasound is important in understanding the severity of the pathology. Regardless, intraoperative findings can reveal more extensive intrasubstance damage and calcinosis/fibrosis. Having confidence with solid gastrocsoleus lengthening techniques and Achilles flapdown methods in addition to having non-absorbable, appropriate tensile suture, a host of variable suture/bone anchors or bridging systems on hand will guarantee a better outcome for your patient and a smoother day for you and your OR staff. Advances in technology and further research continue to broaden the treatment arsenal for chronic Achilles tendinopathy. Deciding what is best for your patient involves an awareness of available options, staying current with evidence-based literature, stepwise exhaustion of conservative to increasingly invasive modalities and consistent communication with your patient regarding expectations and possible outcomes with both the art and science of our practice. Dr. Volkmann is an Associate of the American College of Foot and Ankle Surgeons, and a physician with the University Foot and Ankle Institute in Valencia, CA.